Happy New Year! Here’s some of the latest, greatest research out there that I found interesting and think you can use. Doing deadlifts with cluster sets can make them more effective. First, a little primer on rest-pause training in case you’re not familiar. Rest-pause training is usually done one of two ways. If your goal is strength, you can use a heavy weight and perform 1-3 reps with it, rest briefly, and repeat until you’ve done more total reps with that load than you could have doing a conventional set (say, 8 straight reps). This is called cluster training, and it’s a helpful way to get in a lot of volume with heavy weights. The other approach is, if you’re looking for pure size gains, to use a moderate weight and take your set to failure, then rest a few seconds and pump out a handful of extra reps to add a little more muscle-building stimulus. Both clusters and bodybuilding-style rest-pauses are known by trainers to be effective methods but neither has been studied extensively. One study from the Journal of Sports Sciences just looked at the cluster method—the former approach described above where you do a few reps, rest, and repeat. It was compared to a traditional set and rep scheme. 13 students with less than six months’ lifting experience trained single-leg leg extensions. They used 4 sets of 8 reps with three minutes rest between sets to work one leg, and the other was trained with a cluster of 32 total reps with 17.4 seconds rest between each. In other words, the total amount of work for both legs was the same, but the way it was performed was different. Both legs gained strength and no significant difference was found between them. However, when the subjects used cluster training, their perceived exertion was lower than when they did the traditional set approach. I guess having to do just one rep at a clip made the work seem to go by faster, even if it was technically equal to the traditional method. MY RECOMMENDATION: Do cluster sets from time to time to get practice using heavy loads and to build strength. They’re fun, because you get to rest a lot and they don’t leave you gasping like a typical set of eight or more reps done straight through does. Because you get to re-set yourself so frequently, your form on each rep will likely be very good. But you can’t cluster the f@ck out of your training all the time. Obviously, with so much rest, you never really build up the metabolic fatigue that is necessary for muscle growth, and you don’t condition your muscles for longer durations of work. The other rest-pause approach I described, where you do a set, rest, and then tack on a few more reps at the end, is worthwhile to fill this gap. It accomplishes what cluster sets don’t. Sports Medicine looked at meta-analyses of various core strength studies and studies of core training, and their relationship and impact on overall fitness, strength, and athletic performance. Specifically, the researchers examined 15 studies (that observed 443 subjects overall) that looked at core strength and 16 studies (512 people) that tracked core training. To make a long story short, they found that core strength was “not strongly correlated” with overall muscle strength, power output, balance, or athletic performance. Furthermore, core training was found to have only a “small” effect on core strength compared to “whole-body strength training”. MY RECOMMENDATION: Ditch your Ab Lounge to make room for a squat rack. Seriously, I’ve said for years that the whole concept of the “core” is overblown. Some direct core training is important, of course, just as it’s important to train every area of the body. But programs/trainers/machines that prioritize the core above all else are misguided. 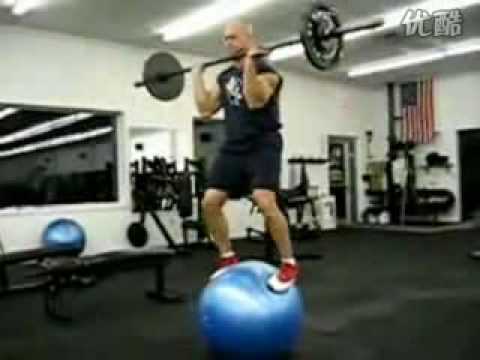 If you can balance on a Swiss ball but you can’t squat your body weight, you’re still weak, slow, out of shape, and unathletic. Here’s how to fix that and get strong, lean, and muscular. The secret to Arnold’s success. Forget exercise for calorie burning. You have to get your metabolism firing all the time, because it’s your resting metabolic rate (RMR) that burns the most fuel throughout the day. Stoke it up and you’ll burn fat just by EXISTING, not busting your kneecaps jogging. The journal Obesity reported on sleep and its affect on RMR. 47 subjects were split into two groups—one was allowed to get a full night’s sleep and the other (after establishing a baseline with two nights of good sleep) was restricted to only four hours per night for five straight nights. Afterward, the sleepless group got one night of 12 hours of sleep. The non-sleepers experienced a significantly lower RMR by day 5 compared to their baseline. About three percent, or 42 calories. But there was a significant increase in RMR between Day 6 and Day 7, after their sleep binge. Their RMR went up six percent, or 60 calories. There was no significant difference between the baseline and the recovery day measurements. The sleep-deprived also gained weight over the course of the study. MY RECOMMENDATION: Sleep as much as you can to get leaner, but if you have a rough week, set a day aside to make up for it. It’s common sense, but you can see how important it is. Sleep, and recovery in general, are a massively overlooked aspect of fitness. 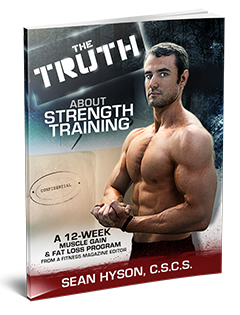 Pick up my Truth About Strength Training book on sale at DISCOUNT this week only HERE. It’s got a 12-week workout and nutrition program and much more.